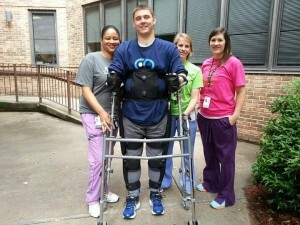 Cole Sydnor using exoskeleton technology. When it comes to functional improvement, every spinal cord injury is different which means there can never be a one-size-fits-all cure, but rather a series of significant breakthroughs that will eventually combine to solve this extremely complex puzzle. These breakthroughs include new science and medical treatments along with therapeutic and adaptive technology for those living with spinal cord injuries. We have all heard bedside horror stories of medical professionals who say, “Here is your chair. Here is what you can expect from life with a spinal cord injury. Get used to it. What you get back in the first few months is all you can expect for the rest of your life.” Nonsense. Whether you move from a C2 to a C5 or an ASIA A to an ASIA B, functional improvement and a cure is possible. But spinal cord research is complex and how does the lay person sift through the scientific data to determine what is important and what is simply untrue? This landscape is full of promise and pitfalls. At United Spinal Assoc of VA we will attempt to create a continuing research collective. A space to share new information, scientific articles, data, questions and feedback. It is our hope to build a Research Advocacy Team within our membership base. If you are interested in joining our upcoming Research Book Club please call us.